PLAYERS TO WATCH: Bishop Eustace suffered key losses to graduation, including No. 1 golfer Drew Skultety, who placed second at sectionals and competed at the state championships. But the Crusaders are happy to welcome back junior Kyle Bartholomew, who should be ready to lead the team now that he’s an upperclassman. Bartholomew carded an 85 at Ramblewood Country Club during the Olympic Conference Tournament, earning first-team honors in the National Division. He also shot 89 at sectionals to tie for 17th. Junior Matt McCaffery is another promising returner who could make some noise at the major tournaments. Junior Michelle Quinn had several rounds in the low 40s during match play and other returners hoping to contribute are sophomores Ryan Kane, Jeff Marshall and Jack Paolini. OUTLOOK: The Crusaders posted an 8-5 record last year and placed third at sectionals. They hope to remain competitive and leave their mark at the big tournaments. PLAYERS TO WATCH: Senior Pat Corbett returns as the No. 1 golfer for Camden Catholic after a solid junior season in which he carded a season-low 42 three times during match play. Seniors Braeden McHugh and Chris Boyce are other veteran leaders who were consistently in the top four. Junior Patrick Galloway hopes to take his game up a notch as an upperclassman and other returners looking to contribute are junior Will McKennon and sophomores Jack Janda and Justin Seo. OUTLOOK: Last season was a rebuilding one for the Irish, but with a solid core in place they should make progress this spring. PLAYERS TO WATCH: Senior Max Rubin has been a top golfer for Cherokee the last two years and is poised for a big final season with the Chiefs. As a junior, he carded a 75 at Ramblewood Country Club to place fourth at the Olympic Conference Tournament and earn American Division first-team accolades. He also shot a 74 to tie for fifth at the prestigious Carl Arena Tournament and had a 40.8 average during match play. Brendan Biddle showed potential as a freshman and other returners expected to contribute are senior Zane Klinshaw, juniors Ethan Ewell, Matt Lafferty and Matt Marini and sophomores Brendan Davis and Jacob Newman. OUTLOOK: After posting a 7-7 record in 2018, the Chiefs should contend for a winning record and Rubin will certainly be a golfer to watch at the major tournaments. PLAYERS TO WATCH: Cherry Hill East has a solid nucleus in place led by seniors Bailey Cummins and David Gibson and junior Simon Miller. Cummins shot a 79 at par-72 Ramblewood County Club during the Olympic Conference Tournament to make his way onto the American Division first team. He also consistently shot in the 40s during match play and fired a season-low of 36. Gibson was East’s top finisher at the Carl Arena Tournament, as he carded an 83 at Riverwinds, and Miller had the best average on the team. Junior Noah Greenspun is another key returner who shot an 82 at the conference tournament and twice finished in the 30s during match play. Juniors Dylan Cardea and Sean Voit and seniors Sam Barch and Jacob Folbaum will also be top competitors. OUTLOOK: The Cougars took a big step forward last year and finished with an 8-8 record. It would not be surprising to seem them go even further and contend for a winning record this spring. PLAYERS TO WATCH: Cherry Hill West brings back its entire roster from last year, including senior Rachel Lee. She shot consistently in the 40s and led the way for the Lions during match play, with a season-low of 43. Sophomore Will Milligan carded a 93 and was West’s top finisher at the Olympic Conference Tournament, and he also tied with Lee for best score on the team at the Carl Arena Tournament. Seniors Brendan Desjardins and Katie Chase are other key veterans, and other returners looking to make an impact are senior Jesse Straub and sophomore Ryan Ott. OUTLOOK: The Lions were competitive in most of their matches in 2018 and finished with a 3-11 record. With everyone back in the fold, their progress should continue. PLAYERS TO WATCH: Gage Wolfle has enjoyed a standout career at Clearview and is coming off a sensational junior sea- son, so it will be exciting to see what he can accomplish in his final campaign. Last year he was the Group III sectional champion and also claimed titles at the Gloucester County Open and Tri-County Conference Tournament. His sectional crown earned him a trip to the Tournament of Champions, where he placed 11th in Group III, and he also finished fifth at the Carl Arena Tournament. Junior Pearse Costello is another key returner who will be expected to take on an expanded role, and sophomore Ty Williams showed promise as a rookie. Senior Luciano DiLisciandro will also look to contribute. OUTLOOK: The Pioneers went 13-1 with a division championship and captured their third straight Gloucester County team title last year. This is shaping up as another successful season and Wolfe will be among South Jersey’s best golfers. PLAYERS TO WATCH: Eastern graduated a strong senior class, including No. 1 golfer Joel Hark, who placed third at sectionals. Junior Tyler Peters leads the returners after a promising sophomore season in which he carded a 79 at Ramblewood Country Club at the Olympic Confer- ence Tournament to earn a spot on the American Division first team. He also shot an 88 at the Carl Arena Tournament and had a low score of 37 during match play. Juniors Grant Wurster, Danny Francesconi and Olivia Rose Arculeo will also look to have an impact. Eight freshmen are set to join the team as well and one or two could find their way into the top six. OUTLOOK: The Vikings, who went 9-4 last year, certainly have some spots to fill in the lineup but have a talented golfer to lead the way in Peters. PLAYERS TO WATCH: Matt Masiejczyk graduated after earning Gloucester Catholic’s top finishes at both sectionals and the Carl Arena Tournament, so new leaders will have to step up. Senior Colin Schumacher played consistently well during match play, with a season-low of 44, and will be a key competitor. Seniors Matt Sasher and Nick Myers are other experienced veterans and junior CJ Guanzon hopes to take his game up a notch as an upperclassman. Senior Zack Snodgrass and sophomore Jason Ruggieri will also look to contribute. OUTLOOK: The Rams posted an 8-3 record and placed fourth at sectionals during another successful season last spring. They hope to continue their winning tradition in 2019. PLAYERS TO WATCH: Haddonfield brings back a stellar senior class that includes Jay Foley, who tied for second at the Colonial Conference Tournament with a 77 at Westwood Golf Club. He also shot a 75 at River- winds to tie for ninth at the Carl Arena Tournament. Finn McGarry and Brian Pelose are other senior leaders who tied for fourth place at sectionals. Pelose was Haddonfield’s best finisher at the Tournament of Champions (TOC) with an 84—good for sixth in Group I—and McGarry carded an 87. Senior Jake Armstrong finished fifth in the conference tournament, shot an 82 at Carl Arena and an 88 at the TOC. George Cooper and Jesse Veasey round out the senior returners and sophomores Cooper Bonawitz and Mason Speh hope to contribute as well. OUTLOOK: The Bulldawgs went 14-4 and won the Central/South Group I championship for the second year in a row and third time in fourth seasons, ultimately taking third in the state. Their seniors will look to go out with another trophy or two. PLAYERS TO WATCH: Junior Carl Ernst has had a 41 average in match play each of his first two seasons and should only get better as an upperclassman. He carded an 82 at the Carl Arena Tournament last year and had a season- low of 33 in a win over GCIT. But Ernst is not the only talented returner, as juniors Bobby Johnson, Brandon Farley and Matt Ciocco and sophomore Rocco SanFelice all played consistently well during match play. Johnson shot an 88 at Carl Arena, while Farley and SanFelice each came in at 93. Seniors David Sladek and Peter Bernardino are other key veterans. OUTLOOK: The Dragons’ 8-5 record included impressive wins over Clearview and Williamstown and they also placed fifth at the Gloucester County Tournament. With all of their top golfers back, they have high hopes for 2019. PLAYERS TO WATCH: Lenape lost four players to graduation, including one of the best golfers in the state in Doug Ergood. 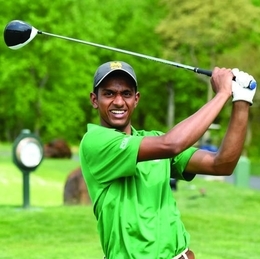 He placed fourth in Group IV at the Meet of Champions, won the prestigious Carl Arena Tournament and consistently shot in the 30s during match play. On the bright side, senior Matt Thomas is another top competitor who is ready to lead the team. He had a 41.4 average during match play—with a seasonlow of 37 on two occasions—and tied for 10th at sectionals with a 76. Thomas also carded a 74 at Riverwinds to tie for fifth in the Carl Arena Tournament. Zach Rush is another experienced senior who twice shot 43 during match play and junior Sam Mohnacs showed promise as a sophomore. OUTLOOK: The Indians went 9-5 with a fifth-place finish at the Burlington County Open and a seventh at sectionals. They will clearly be a different team without Ergood, but should remain competitive and Thomas will be a threat to win at the big tournaments. PLAYERS TO WATCH: Moorestown brings back a roster loaded with talent, but the discussion starts with senior Akhil Giri, who will look to cap his memorable career with another outstanding season. Last year he was the Burlington County champion and placed third at the Carl Arena Tournament. He also carded a 77 at Running Deer to place third at sectionals—his second straight top-five finish in the event—and placed in the top 10 of Group III at the Tournament of Champions (TOC), also for the second year in a row. Junior Hayden Greer placed in the top 10 at sectionals, Carl Arena and the Burlington County Open and shot an 82 at the TOC. Senior Will Tone was the Quakers’ top finisher at the TOC in eighth, and he also tied for 11th at Carl Arena with a 76. Junior Stephen Eigenrauch is yet another key returner who took third in the county and was in the top 20 at Carl Arena with a 78. Seniors Luke Simeone and Matt Button are other top contributors who shot in the high 30s and low 40s during match play. OUTLOOK: The Quakers were South Jersey’s best team in 2018, as they went 20-1, repeated as sectional champions and placed second in Group III at the TOC. They also won team titles at the county and Carl Arena tournaments. They will again set their goals high this spring and several golfers will be in the mix for individual championships. PLAYERS TO WATCH: Senior Alec Ryden is coming off another impressive season and is poised for a big final campaign at Moorestown Friends. Last year he carded a 2-over 74 at Mountain View Golf Course and went on to win the sectional championship in a playoff, earning a trip to the Tournament of Champions (TOC) in the process. During the TOC he shot a 77 at Hopewell Valley, good for third in the state in NonPublic Group B. Ryden also tied for fourth at the Burlington County Open and was an all-Friends Schools League first-teamer. Juniors Jalen and Justin Patel are other key veterans, and sophomore Kian Canelas will look to build on a promising freshman season. Other returners hoping to contribute are senior Dylan Zhou, junior Kobe Koren and sophomore Chris Little. OUTLOOK: After posting a 9-4 record last year, the Foxes should follow Ryden to another winning season and will certainly make noise at the major tournaments. PLAYERS TO WATCH: Paul VI graduated No. 1 golfer Rich Venuto but brings back a solid group of players who gained valuable experience last year. Senior Rob Colleluori fired a 91 at Ramblewood County Club during the Olympic Conference Tournament, earning National Division second-team accolades. Kyle Pernell could be ready to take his game to the next level as a junior, while juniors Logan Fogerty and Brady Carlson should also have an impact. Sophomores Neil Sanchirico and Patrick McCool are expected to play bigger roles and freshman Jack Skiles is hoping to contribute right away. OUTLOOK: The Eagles have a strong chance of improving on last year’s 5-10 record with a deep and promising crop of returners, and could be a darkhorse in their division. PLAYERS TO WATCH: Scott Warner returns as Seneca’s No. 1 golfer and is looking forward to a strong senior season. He carded a 77 at Group II sectionals to finish sixth at help the Golden Eagles claim the South Jersey title. He also shot a 79 at Little Mill Country Club to tie for fourth at the Burlington County Open, carded an 82 at Ramblewood to secure National Division first-team honors at the Olympic Conference Tournament and fired an 88 at the Carl Arena Tournament, tops on the team. Junior Cian Doyle also made the Olympic National first team thanks to his 87 and had a season-low of 40 three times during match play. Junior Jake Meyer is another top competitor who made the all-conference second team, and other returners being counted on are seniors Sean Casey and Eddie Cashwell. OUTLOOK: The Golden Eagles went 15-6—improving by eight wins from the season before—and placed third in the county to go with the South Jersey crown. Warner and the other veterans should make this another successful campaign. PLAYERS TO WATCH: Shawnee’s losses to graduation included No. 1 golfer Kyle Quagliero, who tied for third at sectionals and competed at the Tournament of Champions. A new crop of leaders will have to emerge, and two sophomores who flashed potential as rookies could fill the void. Reece Raley carded an 89 at the Carl Arena Tournament, a 90 at the Olympic Confer- ence Tournament and had a season-low of 42 during match play. Patrick Frake will also look to step up after several solid rounds in match play. Other returners hoping to have an impact are senior Bryce Benson and juniors Scott Minshall and Connor Valentino. Freshman Jack Ross is a top newcomer who could contend for the No. 1 spot on the team. OUTLOOK: The Renegades had another solid season in 2018, posting a 9-5 record, taking third at sectionals and second in the county. They hope to reload around a new cast of standouts. PLAYERS TO WATCH: Washington Township has a terrific nucleus returning, with junior Matt Hanzel leading the way. He carded a 72 to take sixth at sectionals—just missing a trip to the Tournament of Champions—and shot 73 at Ramblewood Country Club to place third overall in the Olympic Conference Tournament and make his way onto the American Division first team. Senior J.D. Donnelly took second at the Gloucester County Open and joined Hanzel on the all-conference first team thanks to his 77. He also shot a 77 at sectionals. Junior Colton Murray claimed fifth at the county tournament and was Washington Township’s top finisher at the Carl Arena Tournament as he carded an 84. Junior Mike LaRocca and senior Matt Davis are other strong competitors. OUTLOOK: The Minutemen’s 14-3 season included the Olympic Conference American Division title, a second-place finish in the county and a fourth at sectionals. They should be in store for more of the same with Hanzel, Donnelly and Murray setting the tone. All schedules subject to change; please check with schools before attending. 4/1 vs. Cherokee, 3:45 p.m.
4/2 at Cherry Hill East, 3:45 p.m.
4/3 at Timber Creek, 3:45 p.m.
4/4 vs. Cherry Hill West, 3:45 p.m.
4/10 at Paul VI, 3:45 p.m.
4/15 at Camden Catholic, 3:45 p.m.
4/16 at Lenape, 3:45 p.m.
4/17 vs. Shawnee, 3:45 p.m.
4/22 at Camden County Tournament, 8 a.m.
4/29 at Cherry Hill West, 3:45 p.m.
4/30 vs. Timber Creek, 3:45 p.m.
5/1 vs. Paul VI, 3:45 p.m.
5/3 vs. Eastern, 3:45 p.m.
5/6 at Seneca, 4 p.m.
5/8 vs. Camden Catholic, 3:45 p.m.
5/9 at Washington Township, 3:45 p.m.
5/14 vs. Seneca, 3:45 p.m.
5/15 at Olympic Conference Tournament, 8 a.m.
5/16 at Audubon, 3:45 p.m.
4/1 vs. Cherry Hill East, 3:45 p.m.
4/3 vs. Seneca, 3:45 p.m.
4/4 at Timber Creek, 3:45 p.m.
4/9 at Paul VI, 3:45 p.m.
4/10 at Cherry Hill West, 3:45 p.m.
4/15 vs. Bishop Eustace, 3:45 p.m.
4/17 vs. Washington Township, 3:45 p.m.
4/25 at Eastern, 3:45 p.m.
4/26 at Cherokee, 3:45 p.m.
4/29 vs. Timber Creek, 3:45 p.m.
5/1 vs. Cherry Hill West, 3:45 p.m.
5/2 vs. Shawnee, 3:45 p.m.
5/6 vs. Paul VI, 3:45 p.m.
5/7 at Seneca, 3:45 p.m.
5/8 at Bishop Eustace, 3:45 p.m.
5/9 at Lenape, 3:45 p.m.
4/1 at Bishop Eustace, 3:45 p.m.
4/3 at Lenape, 3:30 p.m.
4/4 vs. Washington Township, 4 p.m.
4/9 at Cherry Hill East, 3:45 p.m.
4/10 at Eastern, 3:30 p.m.
4/11 vs. Shawnee, 3:45 p.m.
4/23 vs. Lenape, 10 a.m.
4/24 at Paul VI, 3:45 p.m.
4/26 vs. Camden Catholic, 3:45 p.m.
4/29 at Washington Township, 4 p.m.
4/30 vs. Seneca, 4 p.m.
5/1 vs. Eastern, 3:30 p.m.
5/6 at Shawnee, 3:45 p.m.
5/7 vs. Cherry Hill East, 3:45 p.m.
5/8 at Moorestown, 3:45 p.m.
5/9 vs. Cherry Hill West, 3:45 p.m.
4/1 at Camden Catholic, 3:45 p.m.
4/2 vs. Bishop Eustace, 3:45 p.m.
4/3 vs. Shawnee, 3:45 p.m.
4/4 vs. Lenape, 3:45 p.m.
4/8 vs. Eastern, 3:45 p.m.
4/9 vs. Cherokee, 3:45 p.m.
4/10 vs. Washington Township, 3:45 p.m.
4/23 at Shawnee, 3:45 p.m.
4/24 at Cherry Hill West, 3:45 p.m.
4/25 vs. Paul VI, 3:45 p.m.
4/30 at Timber Creek, 3:45 p.m.
5/1 at Washington Township, 3:45 p.m.
5/6 at Eastern, 3:45 p.m.
5/7 at Cherokee, 3:45 p.m.
5/9 at Seneca, 4 p.m.
5/16 at Moorestown, 3:30 p.m.
4/1 vs. Washington Township, 3:45 p.m.
4/4 at Bishop Eustace, 3:45 p.m.
4/8 at Eastern, 3:45 p.m.
4/10 vs. Camden Catholic, 3:45 p.m.
4/11 vs. Timber Creek, 3:45 p.m.
4/23 vs. Paul VI, 3:45 p.m.
4/24 vs. Cherry Hill East, 3:45 p.m.
4/25 at Shawnee, 3:45 p.m.
4/29 vs. Bishop Eustace, 3:45 p.m.
4/30 vs. Lenape, 3:45 p.m.
5/1 at Camden Catholic, 3:45 p.m.
5/3 at Seneca, 4 p.m.
5/6 at Timber Creek, 3:45 p.m.
5/7 at Paul VI, 3:45 p.m.
5/8 vs. Seneca, 4 p.m.
5/9 at Cherokee, 3:45 p.m.
4/2 at Highland, 3:30 p.m.
4/3 at Hammonton, 4 p.m.
4/5 at GCIT, 3:30 p.m.
4/8 at Kingsway, 4 p.m.
4/15 at Highland, 3:30 p.m.
4/16 at Hammonton, 3:45 p.m.
4/18 at Williamstown, 3:30 p.m.
4/24 at GCIT, 3:30 p.m.
4/25 at Delsea, 3:30 p.m.
4/30 at Kingsway, 3:30 p.m.
5/1 at Williamstown, 3:30 p.m.
5/7 at Washington Township, 3:45 p.m.
5/8 at Mainland, 4 p.m.
4/1 at Paul VI, 3:45 p.m.
4/3 vs. Washington Township, 3:45 p.m.
4/4 vs. Shawnee, 3:45 p.m.
4/8 at Cherry Hill East, 3:45 p.m.
4/10 vs. Cherokee, 3:30 p.m.
4/17 at Seneca, 4 p.m.
4/23 at Washington Township, 3:45 p.m.
4/25 vs. Camden Catholic, 3:30 p.m.
5/1 at Cherokee, 3:30 p.m.
5/3 at Bishop Eustace, 3:45 p.m.
5/6 vs. Cherry Hill East, 3:45 p.m.
5/7 at Shawnee, 3:45 p.m.
5/8 at Lenape, 3:45 p.m.
5/9 vs. Timber Creek, 3:30 p.m.
4/2 at Pitman, 3:30 p.m.
4/3 at Pennsville, 3:30 p.m.
4/5 vs. Clayton, 3:30 p.m.
4/10 at Penns Grove, 3:30 p.m.
4/15 vs. Pitman, 3:30 p.m.
4/17 vs. Pennsville, 3:30 p.m.
4/24 at Clayton, 3:30 p.m.
4/29 at Wildwood, 3:30 p.m.
5/1 vs. Penns Grove, 3:30 p.m.
5/3 vs. Wildwood, 3:30 p.m.
5/9 at Schalick, 3:30 p.m.
4/8 vs. West Deptford, 3:30 p.m.
4/10 vs. Gateway, 3:30 p.m.
4/11 vs. Northern Burlington, 3:30 p.m.
4/15 vs. Haddon Township, 3:30 p.m.
4/17 vs. Audubon, 3:30 p.m.
4/18 vs. Sterling, 3:30 p.m.
4/23 vs. Moorestown, 3:30 p.m.
4/24 vs. Overbrook, 3:30 p.m.
4/29 at Overbrook, 3:30 p.m.
5/1 at Audubon, 3:30 p.m.
5/3 at Gateway, 3:45 p.m.
5/6 at Haddon Township, 4 p.m.
5/7 at Colonial Conference Tournament, 1 p.m.
5/9 at Sterling, 3:45 p.m.
5/10 at West Deptford, 3:45 p.m.
4/1 at Williamstown, 4 p.m.
4/3 vs. Highland, 4 p.m.
4/4 at Cumberland, 4 p.m.
4/5 at Hammonton, 4 p.m.
4/8 vs. Clearview, 4 p.m.
4/10 at GCIT, 4 p.m.
4/12 at Schalick, 4 p.m.
4/22 at West Deptford, 4 p.m.
4/24 vs. Hammonton, 4 p.m.
4/26 vs. Williamstown, 4 p.m.
4/30 at Clearview, 4 p.m.
5/6 vs. Cumberland, 4 p.m.
5/8 at Delsea, 4 p.m.
5/10 vs. Salesianum, 4 p.m.
4/1 at Timber Creek, 3:45 p.m.
4/2 vs. Seneca, 4 p.m.
4/3 vs. Cherokee, 3:30 p.m.
4/4 vs. Cherry Hill East, 3:30 p.m.
4/10 at Shawnee, 3:30 p.m.
4/11 at Washington Township, 3:45 p.m.
4/15 at Eastern, 3:30 p.m.
4/16 vs. Bishop Eustace, 3:30 p.m.
4/17 at Paul VI, 3:30 p.m.
4/23 at Cherokee, 10 a.m.
4/29 vs. Cherry Hill East, 3:30 p.m.
4/30 at Cherry Hill West, 3:30 p.m.
5/1 vs. Shawnee, 3:30 p.m.
5/6 vs. Washington Township, 3:45 p.m.
5/8 vs. Eastern, 3:30 p.m.
5/9 vs. Camden Catholic, 3:30 p.m.
4/1 at Delran, 3:45 p.m.
4/2 vs. Williamstown, 3:30 p.m.
4/3 vs. Cinnaminson, 3:30 p.m.
4/4 at Pinelands, 12:30 p.m.
4/8 at Garden State Cup, 11 a.m.
4/8 at Bordentown, 3:45 p.m.
4/16 at Galloway National Invitational, 3:30 p.m.
4/17 vs. Pennsauken, 3:30 p.m.
4/18 vs. Delran, 3:30 p.m.
4/23 at Haddonfield, 3:30 p.m.
4/24 at Audubon, 3:45 p.m.
4/25 vs. Northern Burlington, 3:45 p.m.
4/26 at GCIT, 3:45 p.m.
5/1 vs. Burlington Township, 3:45 p.m.
5/6 vs. Brick Memorial, 3:45 p.m.
5/7 at New Egypt, 3:45 p.m.
5/8 vs. Cherokee, 3:45 p.m.
5/15 vs. Southern, 4 p.m.
5/16 vs. Cherry Hill East, 3:30 p.m.
5/20 vs. Audubon, 3:30 p.m.
5/21 at Northern Burlington, 3:30 p.m.
4/9 at Friends Central, 4 p.m.
4/10 at Westtown, 4 p.m.
4/11 vs. George School, 4 p.m.
4/16 vs. Shipley and Westtown, 4 p.m.
4/18 at West Deptford, 4 p.m.
4/22 at Shipley, 4 p.m.
4/23 vs. Holy Cross, 4 p.m.
4/25 at Abington Friends, 4 p.m.
4/29 vs. Abington Friends, 4 p.m.
4/30 vs. Friends Central, 4 p.m.
5/1 at George School, 4 p.m.
4/1 vs. Eastern, 3:45 p.m.
4/8 at Washington Township, 3:45 p.m.
4/9 vs. Camden Catholic, 3:45 p.m.
4/10 vs. Bishop Eustace, 3:45 p.m.
4/15 vs. Timber Creek, 3:45 p.m.
4/16 vs. Delsea, 3:45 p.m.
4/17 vs. Lenape, 3:45 p.m.
4/18 at Haddon Township, 3:45 p.m.
4/23 at Cherry Hill West, 3:45 p.m.
4/24 vs. Cherokee, 3:45 p.m.
4/25 at Cherry Hill East, 3:45 p.m.
4/29 vs. Seneca, 3:45 p.m.
4/30 at Shawnee, 3:45 p.m.
5/1 at Bishop Eustace, 3:45 p.m.
5/6 at Camden Catholic, 3:45 p.m.
5/7 vs. Cherry Hill West, 3:45 p.m.
5/8 at Timber Creek, 3:45 p.m.
5/9 at Cumberland, 4 p.m.
5/10 at Seneca, 3:45 p.m.
4/2 at Lenape, 4 p.m.
4/3 at Camden Catholic, 3:45 p.m.
4/4 at Haddon Heights, 3:45 p.m.
4/5 vs. Timber Creek, 4 p.m.
4/9 vs. Washington Township, 4 p.m.
4/16 vs. Shawnee, 3:45 p.m.
4/17 vs. Eastern, 4 p.m.
4/29 at Paul VI, 3:45 p.m.
4/30 at Cherokee, 4 p.m.
5/1 at Timber Creek, 4 p.m.
5/3 vs. Cherry Hill West, 4 p.m.
5/6 vs. Bishop Eustace, 4 p.m.
5/7 vs. Camden Catholic, 4 p.m.
5/8 at Cherry Hill West, 4 p.m.
5/9 vs. Cherry Hill East, 4 p.m.
4/3 at Cherry Hill East, 3:45 p.m.
4/4 at Eastern, 3:45 p.m.
4/8 vs. Timber Creek, 3:45 p.m.
4/10 vs. Lenape, 3:45 p.m.
4/11 at Cherokee, 3:45 p.m.
4/15 vs. Washington Township, 3:45 p.m.
4/16 at Seneca, 3:45 p.m.
4/17 at Bishop Eustace, 3:45 p.m.
4/23 vs. Cherry Hill East, 3:45 p.m.
4/25 vs. Cherry Hill West, 3:45 p.m.
4/30 vs. Paul VI, 3:45 p.m.
5/1 at Lenape. 3:45 p.m.
5/2 at Camden Catholic, 3:45 p.m.
5/6 vs. Cherokee, 3:45 p.m.
5/7 vs. Eastern, 3:45 p.m.
5/8 at Washington Township, 3:45 p.m.
5/10 at Cumberland, 3:45 p.m.
4/1 at Cherry Hill West, 4 p.m.
4/3 at Eastern, 3:45 p.m.
4/4 at Cherokee, 4 p.m.
4/8 vs. Paul VI, 3:45 p.m.
4/9 at Seneca, 4 p.m.
4/10 at Cherry Hill East, 3:45 p.m.
4/11 vs. Lenape, 4 p.m.
4/15 at Shawnee, 4 p.m.
4/17 at Camden Catholic, 3:45 p.m.
4/23 vs. Eastern, 3:45 p.m.
4/25 vs. Timber Creek, 3:45 p.m.
4/29 vs. Cherokee, 4 p.m.
5/1 vs. Cherry Hill East, 3:45 p.m.
5/6 at Lenape, 4 p.m.
5/7 vs. Clearview, 3:45 p.m.
5/8 vs. Shawnee, 4 p.m.
5/9 vs. Bishop Eustace, 4 p.m.
PLAYERS TO WATCH: Senior Morgan Hambrecht returns as Cherokee’s No. 1 golfer after placing second at the South Jersey Invitational with a 39 as a junior. She also carded a 45 at the LPGA Girls Golf Classic and will continue her career at Eastern University. Taylor Miles is another senior leader and other returners are sophomores Lauren Cotton, Daniella Duenas, Riley McGory and Riley Eckert. OUTLOOK: In their first season last year, the Chiefs posted a 2-9 record but were competitive in almost every match, with most of their losses coming by single digits. Five more players are join- ing the program this season and Cherokee has high hopes for a successful year in the brand-new Olympic Conference, consisting of sister schools Lenape, Seneca and Shawnee along with Kingsway, Moorestown, Cumberland, Paul VI and Williamstown. PLAYERS TO WATCH: Kingsway brings back almost its entire roster, including junior Brooke Kenney, who shot a 45 over nine holes at Pitman Golf Course to be crowned the Gloucester County champion last year. She also led the way for the Dragons during matches, twice carding a 45. Anjana Chamarthi, a senior, and Olivia Heyer, a junior, also placed in the top 10 at the county tournament. Madison Meyers and Lucy Domingue are other senior leaders and other returners hoping to make progress are juniors Brianna Sistrunk and Jackie Descano and sophomore Kylie Ennis. Five freshmen golfers are also hoping to contribute as well. OUTLOOK: The Dragons compiled a 9-4 record last year and expect to be in contention for another winning season with Kenney leading the charge. PLAYERS TO WATCH: Like most South Jersey girls golf teams, Lenape just recently added the sport and competed as a pilot program the last two years. Several top players are back from last season, including juniors Brynn Foley and Julia Ergood and senior Sydney Goldstein. Freshmen Katie Skidmore and Emily Farbaniec are two newcomers expected to have an impact right away. OUTLOOK: The Indians posted a 7-2 record last year in scrimmages and expect to be competitive in their first official season as a member of the new Olympic Conference. The district’s collaboration with GolfU and PGA professional Brad Hare has generated great interest in the sport in the area. PLAYERS TO WATCH: Moorestown graduated its two top golfers—who both placed in the top 25 at sectionals—but still has a solid core in place. Senior Catherine Dare played consistently well during match play and fired a season-low of 43. Senior Hannah Corbin also carded a 43 during match play and shot a 97 at the Carl Arena Tournament. Lia Hogg and Lauren Chen are other senior leaders capable of carrying the Quakers on any given day. Chen tied for fifth at the LPGA Girls Golf Classic with a 45 and Hogg was just two strokes behind her. Sophomore Carly Kramer showed potential as a rookie and other returners are senior Izzy Perhamand junior Teigan Balfour. Five freshmen and three other newcomers are also expected to have an impact. OUTLOOK: With a stellar senior class, the Quakers should be able to follow up last year’s 9-4 season with another winning record. They are moving from the Central Jersey Girls Golf League to the new Olympic Conference with Cherokee, Lenape, Seneca, Shawnee, Cumberland, Kingsway, Paul VI and Williamstown. PLAYERS TO WATCH: Paul VI is adding girls golf for the first time this season and the key player to watch is senior Annie Skiles. She had several matches finishing in the top four on the boys team last season. Morrissey Walsh is another senior leader and other experienced players are sophomores Ava Colonna, Grace Flocco and Brieana Villari. OUTLOOK: The Eagles have solid numbers in the program and excitement is high as they look to build a foundation for the future. PLAYERS TO WATCH: Junior Kayla Gutierrez has a lot of experience in local tournaments and will look to grab hold of the No. 1 spot for Seneca in the program’s first year as an official program. Sophomore Maddie Lawlor showed promise as a rookie and carded a 49 at the LPGA Girls Golf Classic. Juniors Maddie Dwyer and Devon Nippins are other golfers expected to have an impact. OUTLOOK: The Golden Eagles have some talented players to build around and should make some noise in their first season as an official program. PLAYERS TO WATCH: A strong junior class leads the way for Shawnee in its first official season. Golfers to keep an eye on are Quinn Delorme, Jessica Campbell, Mackenzie Reed, Julia Gilbert, Rebecca Chernoff, Emily Wright, Olivia Summerville and Julia Dobis. OUTLOOK: The Renegades recorded an impressive 6-2 record in exhibition matches last year and the highlight of the season was their victory in the Lenape Regional High School District Girls Golf Cup held at Little Mill. They are excitedly looking forward to the spring season. 4/1 vs. Moorestown, 3:45 p.m.
4/4 vs. Seneca, 4 p.m.
4/5 at Shawnee, 3:45 p.m.
4/10 at Lenape, 3:30 p.m.
4/12 vs. Kingsway, 4 p.m.
4/30 at Paul VI, 3:45 p.m.
5/6 vs. Shawnee, 3:45 p.m.
5/9 at Kingsway, 4 p.m.
4/2 at Moorestown, 4 p.m.
4/9 at Shawnee, 4 p.m.
4/11 at Lenape, 3:45 p.m.
4/12 at Cherokee, 4 p.m.
4/30 vs. Lenape, 4 p.m.
5/3 vs. Seneca, 4 p.m.
5/7 vs. Shawnee, 4 p.m.
5/9 vs. Cherokee, 4 p.m.
5/10 at Seneca, 4 p.m.
4/3 at Cumberland, 3:30 p.m.
4/5 vs. Seneca, 3:30 p.m.
4/11 vs. Kingsway, 3:45 p.m.
4/15 vs. Shawnee, 3:30 p.m.
4/30 at Kingsway, 4 p.m.
5/6 at Moorestown, 3 p.m.
5/15 at Shawnee, 3:30 p.m.
4/1 at Cherokee, 3:45 p.m.
4/2 vs. Kingsway, 3:30 p.m.
4/11 at Cumberland, 3:45 p.m.
4/15 at S.J. Girls Invitational, 1 p.m.
4/17 at Shawnee, 3:45 p.m.
4/25 vs. Williamstown, 3:30 p.m.
4/30 vs. Cumberland, 3 p.m.
5/3 at Hightstown, 4 p.m.
5/6 vs. Lenape, 3 p.m.
5/7 vs. Seneca, 3 p.m.
5/8 vs. Paul VI, 3:30 p.m.
5/9 vs. Shawnee, 3:30 p.m.
4/3 at Seneca, 3:45 p.m.
4/8 at Shawnee, 3:45 p.m.
4/25 vs. Cumberland, 3:45 p.m.
4/30 vs. Cherokee, 3:45 p.m.
5/8 at Moorestown, 3:30 p.m.
4/1 vs. Cumberland, 4 p.m.
4/2 at Williamstown, 3:30 p.m.
4/3 vs. Paul VI, 3:45 p.m.
4/5 at Lenape, 3:30 p.m.
4/18 vs. Shawnee, 3:45 p.m.
5/7 at Moorestown, 3 p.m.
4/3 vs. Notre Dame, 3:45 p.m.
4/4 at Southern, 3:45 p.m.
4/5 vs. Cherokee, 3:45 p.m.
4/9 vs. Kingsway, 3:45 p.m.
4/15 at Lenape, 3:45 p.m.
4/17 vs. Moorestown, 3:45 p.m.
4/18 at Seneca, 3:45 p.m.
4/24 at Cumberland, 3:45 p.m.
5/2 at Notre Dame, 3 p.m.
5/6 at Cherokee, 3:45 p.m.
5/7 at Kingsway, 4 p.m.
5/8 vs. Southern, 3:45 p.m.
5/9 at Moorestown, 3:30 p.m.
5/14 vs. Williamstown, 3:45 p.m.
5/15 vs. Lenape, 3:45 p.m. Published (and copyrighted) in Suburban Family Magazine, Volume 9, Issue 11 (January 2019).